The positive benefits of making rap music and videos about issues that matter to young people in regional Indigenous communities is demonstrated by Desert Pea Media – the 2013 NAPCAN NSW Play Your Part award recipient. The contemporary storytelling organisation has grown its output to produce 33 rap videos since 2014. 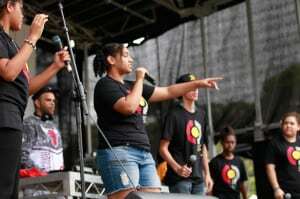 The creation of the songs, videos and performance is led by young people and guided by a group of experienced Desert Pea Media community artists. The organisation creates a dialogue with communities through storytelling, music and film about issues such as domestic violence and mental health. Watch the video – Bush Mob Crew ‘Know your Rights’ which was made in Alice Springs in May. The visual story and song is performed by young Indigenous people about knowing their rights when engaging with the law. Made with the support of the Central Australian Aboriginal Legal Aid service (Ashurst Lawyers, Alice Springs Town Council and UN Ltd), the song and video is about how to operate in the police and judicial system in a positive way. Toby Finlayson founded Desert Pea media when he was 19 years-of-age, (14 years ago), to create change through storytelling, in a non-confrontational way, to create a more respectful and inclusive popular culture for everyone in Australia. “Indigenous people are some of the most marginalised in Australia so it makes sense to predominately work in Indigenous communities, but we’ll work anywhere where dialogue and education is needed around social and cultural issues,” said Mr Finlayson. There are three other videos in post-production at the moment. Two were made with Mission Australia in Dubbo and Wellington in New South Wales and the other in the Indigenous community of Maningrida, Arnhem Land, Northern Territory. Toby Finlayson, Creative Director of Desert Pea media, said that the theme for the videos made in Dubbo and Wellington was mental health for young people and will be released during mental health week. “My father is a psychologist, he was part of the project which focused on dealing with mental health and suicide,” he said. The creation of the music and visual storytelling involves a collaboration with community members, young people, service providers, elders and Desert Pea staff and is also part of a mentoring program for young people. “It’s about trust and adhering to cultural protocols so everyone’s comfortable and respected. We work with elders and the community first.” The Tin Town Trackers – ‘Bringin it Back’ video, is about issues affecting young people in the Indigenous community in Coonamble, NSW, such as cultural re-engagement, leadership, and drug and alcohol abuse. The video took five days to write record and shoot and was made in partnership with Medicare Local Western NSW. The Desert Pea artists ask the locals about what’s going on in the community and the effects of issues such as family violence, relationships and mental health. The points are written on a whiteboard and the young people work with Desert Pea staff to turn the points into a narrative. Desert Pea Media producers bring a ‘skeleton beat’, a groove that creates a rhythm to write the lyrics to, the producers then spend many hours to polish and arrange the compositions in post production. “Many young people are all shy to start with. “There’s a big shame factor for lots of Indigenous kids, it’s basically debilitating. The Desert Pea Media Creative Director said that is was a real honour to be recognised with a Play Your Part Award for the achievements for young people. “It’s a difficult space – mental health and domestic violence, which are serious issues for individuals and communities. The response from the community has been overwhelmingly positive. “Some systems set Aboriginal and Torres Strait Islander people up to fail such as education, health, employment and the legal system which are not tailored for them. “Our process is to set them up to succeed. He said that it’s obvious to community members and to us to, that young people grow through the process, ‘especially for them to see the videos and see how amazing they really are’. Desert Pea’s next rap video project will be in Moree working with a grassroots men’s group for an adult, cultural program. The company is looking for more projects for 2015 people so are calling for communities to contact them. This year’s NSW Play Your Part award recipients will be announced next Friday 4 September at the launch of National Child Protection Week by His Excellency General the Honourable Sir Peter Cosgrove AK MC (Retd).